Gordon’s back, back again. Gordon’s back, tell a friend. Beloved four-time NASCAR Sprint Cup champion Jeff Gordon is coming out of retirement to drive Dale Earnhardt Jr.’s car at Indianapolis and Pocono while Earnhardt recovers from concussion-like symptoms. NASCAR confirmed today that Earnhardt would be out for at least two more weeks due to ongoing issues with balance and nausea, which he described in detail on Dirty Mo Radio’s The Dale Jr. Download. Earnhardt’s prior history with concussions combined with those symptoms and recent hard hits at Michigan and Daytona prompted doctors to recommend that he sit out from racing until he’s back to normal. 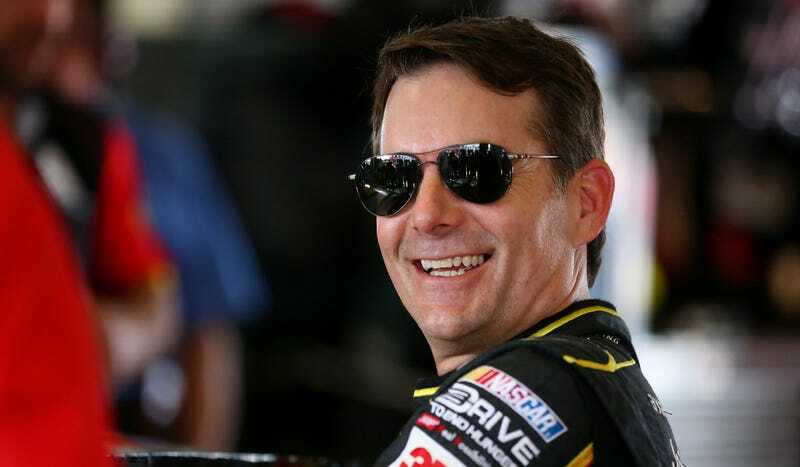 So, recent retiree and Fox Sports commentator Jeff Gordon will be driving Earnhardt’s No. 88 Hendrick Motorsports Chevrolet for the next two races. Gordon is an ex-Hendrick driver and still holds the record for the most number of Sprint Cup wins at Indianapolis Motor Speedway, so this substitution makes plenty of sense. Now if we can just talk NBC (who handles NASCAR broadcasts for the latter half of the year) to let Gordon comment on the race from inside his car, it’ll feel like he never left either gig. As for Earnhardt, there is still no firm timeline for his return. He sat out from racing at New Hampshire last weekend and was reevaluated Tuesday at the University of Pittsburgh Medical Center Sports Medicine Concussion Program, per NASCAR. Because concussion symptoms are involved, NASCAR requires Earnhardt to be cleared for return by an independent board-certified neurologist with at least five years of experience dealing with sports-related head injuries.